Express your interest in celestial bodies with INM Crystal’s beautiful sterling silver Sun, Stars and Moon charms. These finely crafted silver charms are perfect components for bracelet, necklace, earring and even scrapbook embellishments. 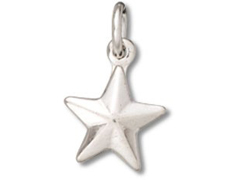 Add a heavenly touch to your jewelry and gifts with these beautiful Sun, Stars and Moon charms.